Not all dogs spend their days snoozing on the couch. Some have important military jobs protecting the lives of hardworking soldiers and private citizens. 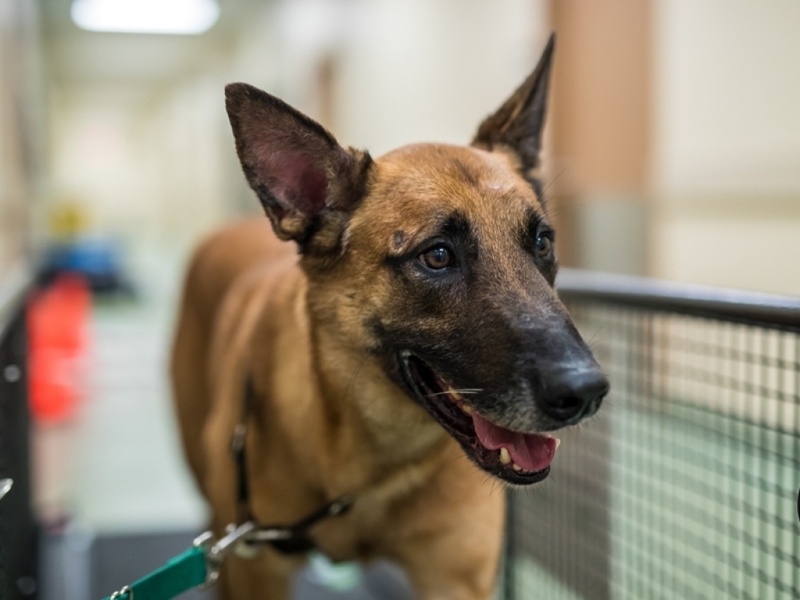 At Lackland Air Force Base in San Antonio, Texas, a dedicated team of veterinarians and technicians do their best to keep these military working dogs in top condition. In the past, infantries relied on dogs during times of war to help guard military bases, carry messages and eventually, to locate injured soldiers. More recently, trainers at the military base have channeled the dogs’ keen sense of smell to help detect explosives or drugs and in some cases, even sniff down the people who plant explosive devices. The dogs have become so essential to the defense effort they’re considered military officers, receive medals, and are often given a hero’s funeral with full military honors. 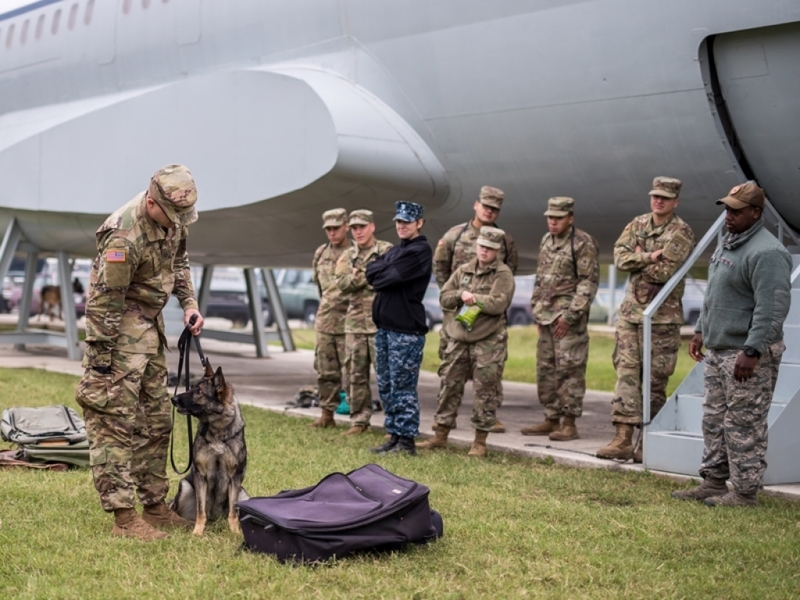 In addition to training dogs and their handlers for deployment in the Navy, Army, Air Force and Coast Guard, the 341st Training Squadron at Lackland Air Force Base also trains dogs to work in airports for the Transportation Security Administration (TSA) and for the secret service. This kind of work usually requires strong, large-breed dogs such as German Shepherds, Belgian Malinois and Labrador Retrievers. The dogs must be able to work with a handler, climb all kinds of terrain, be motivated by rewards and, in some cases, apprehend an offender. 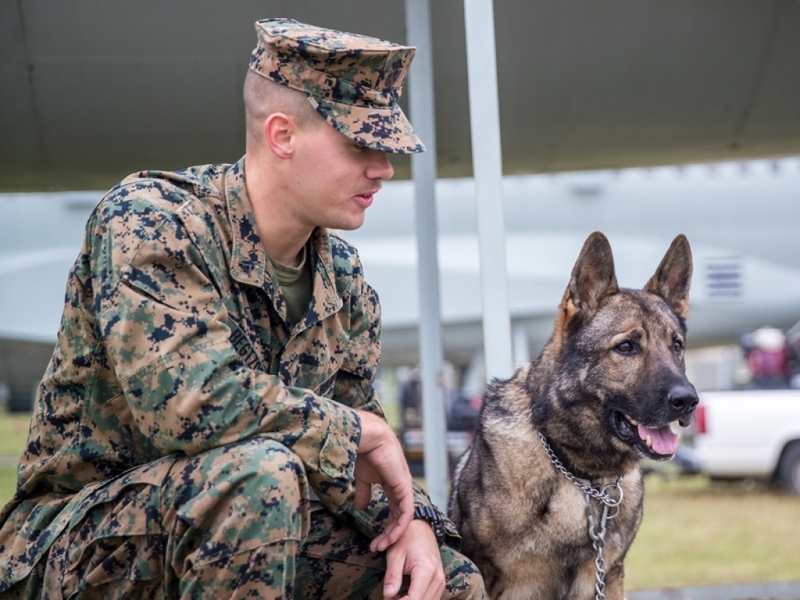 Typically, it takes It takes 100 to 120 training days for a dog to become fully trained and certified out of the Department of Defense MWD training course, commonly referred to as K-9 boot camp. 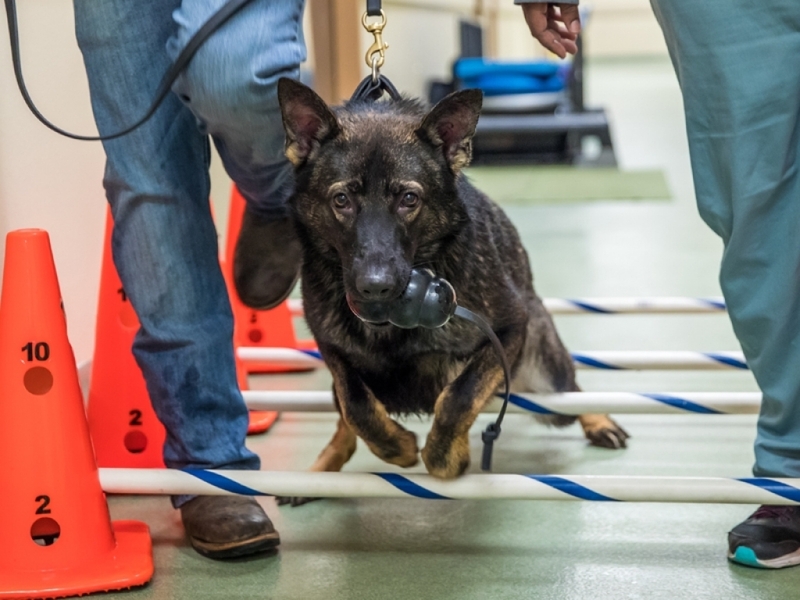 Keeping these dogs healthy is a full-time job for the veterinarians employed at the Holland Working Dog Hospital on the air force base. In this 32,000-square-foot hospital — a little larger than half a football field — some 14 veterinarians, 24 veterinary technicians and additional support staff provide medical care for dogs at all stages of their life spans. Many of these veterinarians have additional education beyond vet school, making them specialists in areas such as surgery, radiology (interpreting different kinds of x-rays), or rehabilitation. 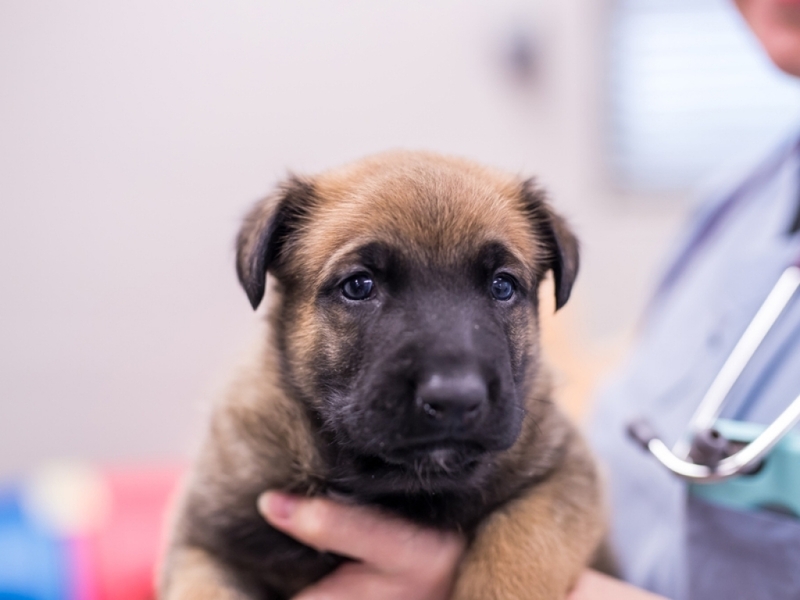 Veterinarians at the Holland MWD hospital are also involved with breeding and raising the canine athletes of the future. This program has become so successful, it is estimated that they produce an “elite” athlete in almost every liter. Puppies who are born at Lackland AFB go out to foster care with members of the community after weaning. In foster care, the puppies are able to have normal dog experiences. They encounter people, traffic, parks, stores and other dogs. These foster experiences are important to the socialization of the puppies. After time with the foster families, the puppies are used to going anywhere. Formal training starts at 7 months of age for the puppies. At 1 year of age, the veterinary team at the Holland MWD Hospital evaluates the dogs to see if they are ready for the full training program. Foster families or others can adopt dogs that don’t make the cut. 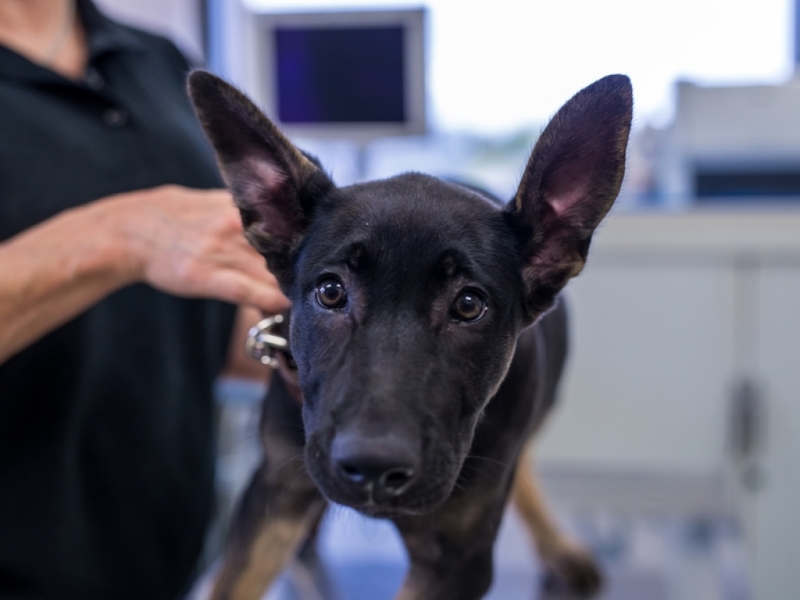 While the dogs are in training, the veterinarians perform regular physical exams, lab testing and preventive care, including vaccinations, routine surgeries, parasite prevention and dental care so dogs are ready to go on patrol when duty calls. As you can imagine, athletic dogs working the front lines can become injured. In some cases, dogs are flown from military bases around the world to the Holland Working Dog Hospital for treatment. Working with state-of-the-art equipment, these veterinarians can perform advanced medical procedures such as hip replacements and brain surgeries, if necessary. 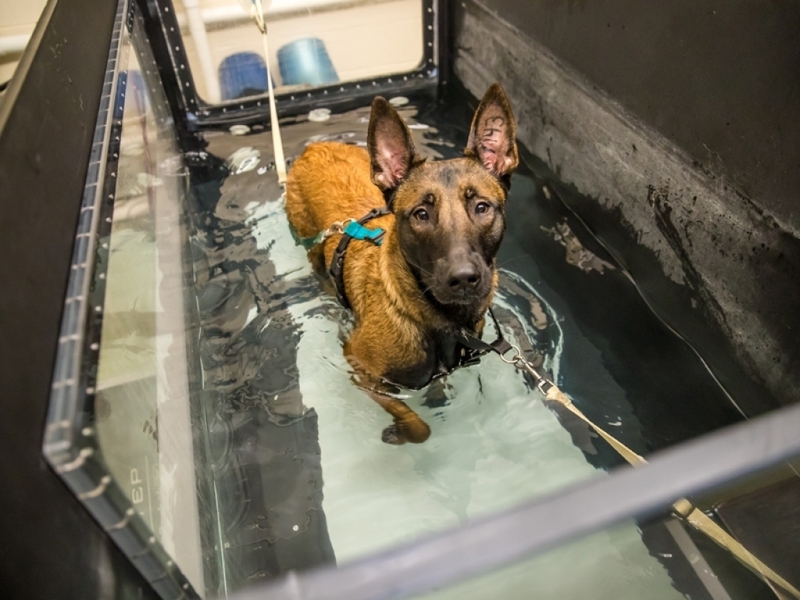 If dogs need extra help to strengthen muscles or regain joint movement, veterinarians can provide physical therapy using underwater treadmills and other equipment. The goal is to get the dogs back in good physical shape so they can return to work. And when it’s time for the dogs to retire, some go on to work in law enforcement or are adopted by families who provide them with a soft bed and a loving home in appreciation for their military service. As a veterinarian in the Army Veterinary Corps, you can help care for dogs that work in combat or help support the health of dogs owned by soldiers and their families. You may even be sent on humanitarian missions to fight diseases in other countries. For students who qualify, the military may even provide a scholarship to help pay for veterinary school expenses. 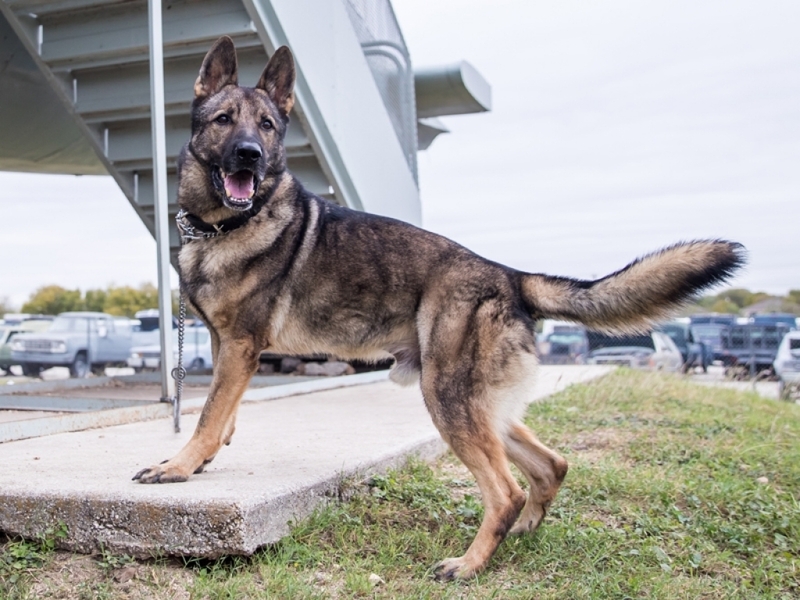 This video takes you inside Lackland Air Force Base in San Antonio, Texas where military working dogs and their handlers train to be sent into combat locations around the world. 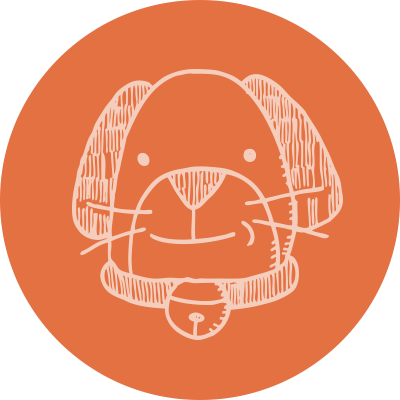 You’ll see how the dedicated veterinarians at the Holland Working Dog Hospital work with dogs of all ages to protect their health and support their important role as canine soldiers. This video is low on the gross meter. There are only a few things that might gross you out if you’re sensitive. You will see a few surgical scenes, but they’re brief and limited in their exposure to the procedure. all those dogs in the photos are very pretty. That’s pretty awesome! Helping animals AND your country at the same time!